Mid September the trees of the creeks which feed the Little Missouri River begin to transform into shades of yellow and orange, this scene west of Elkhorn Ranch, north of Sentinel Butte. Enticed by the thought of fall foliage color changes in the badlands areas of western North Dakota, our quest began on a late September day. Our goal was to experience in depth the hiking trails of the south unit of Theodore Roosevelt National Park, to deliberately seek out vistas we had missed in our combined thirty plus years of visits there. As we ascended the park drive above the fall foliage over the quaint cowboy town of Medora, we could see the Marquis de Mores’ Chateau in the distance. Thinking a Monday after the height of tourist season was long gone would lead us to serenity and fall colors, we drove into Medora, which is to some the mecca of the North Dakota badlands. What a busy place we encountered! It was a nice surprise in an economic sense, to see the quaint cowboy town thriving after the big commercial push for summer visitors was over. We stopped at one of our favorite places in Medora, Western Edge Book Store, and had a good visit with Doug the owner. He informed us that, indeed, business was brisk. Unexpectedly so. Nice! We also checked in with Justin at the Medora Convention & Visitor Bureau. He echoed Doug. Medora was unusually busy, and in a very good way! Medora is open year ’round, always welcomes tourists. Medora’s summer activities may be well known by most, but there are things to do in Medora year around. Next stop, Theodore Roosevelt National Park. The visitor center there is a must-stop for us. Time spent conversing with the friendly and knowledgable rangers always provides additional ideas to expand our park visit. A stop at the Visitor Center at Theodore Roosevelt National Park near Medora always yields information delivered with a smile. Of special interest before entering Theodore Roosevelt National Park is the location and time for wild life sightings there. A line of cars at the park entrance? We hadn’t expected a wait in line. Construction and congestion in the parking area proved to add a bit of a challenge to our agenda, and ate up a bit of our time. What appeared to be extensive road construction began immediately as we entered the park. The line up of cars was long, with long delays expected. As we made use of our time photographing the myriad of autumn colors of Medora, we began to get antsy. Our goal to set up camp and hike through the park colors no longer seemed realistic. While Theodore Roosevelt National Park usually affords a bit of elbow space, today was not that day. Flexibility is essential in any satisfying travel experience. Some circumstances are beyond our control, and we often find alternatives to reach our travel goals when confronted by unexpected circumstances. This was one of those times! Where could we go to immerse ourselves in the fall colors of the badlands, hike in near solitude, and relax by a campfire? After just a few moments of reflection the thought of one remote area where we’d not been for quite some time seemed the answer. Elkhorn Campground! Our arrival at Theodore Roosevelt’s Elkhorn Ranch was timed perfectly to experience the pinks, oranges, and yellows of was had been white puffy clouds. It may take some time to drive there, but it’s worth it! On this day the scoria roads were dried from recent rains, in good shape. We arrived at our destination in time to set up camp and for a late afternoon visit to Theodore Roosevelt’s Elkhorn Ranch, 2.5 miles away. We were just in time for golden hour! The lowering sun was changing the foliage and clouds to shades of pink and orange and yellow! Elkhorn Campground, maintained by the US Forest Service, provides camping spots which offer some seclusion, as well as drive through camping areas for larger vehicles and horse trailers. As the sun lowered in the sky, the colors grew more intense as we drove deeper into the badlands to visit Theodore Roosevelt’s Elkhorn Ranch. And then, the best part of the day! We were successful in immersing ourselves in quiet, near solitude. As a bonus we were able to spend time on Theodore Roosevelt’s Elkhorn Ranch site. But unknowingly, the best part of the day was yet to come. Very often that the most memorable experiences we have are those unplanned, unanticipated. 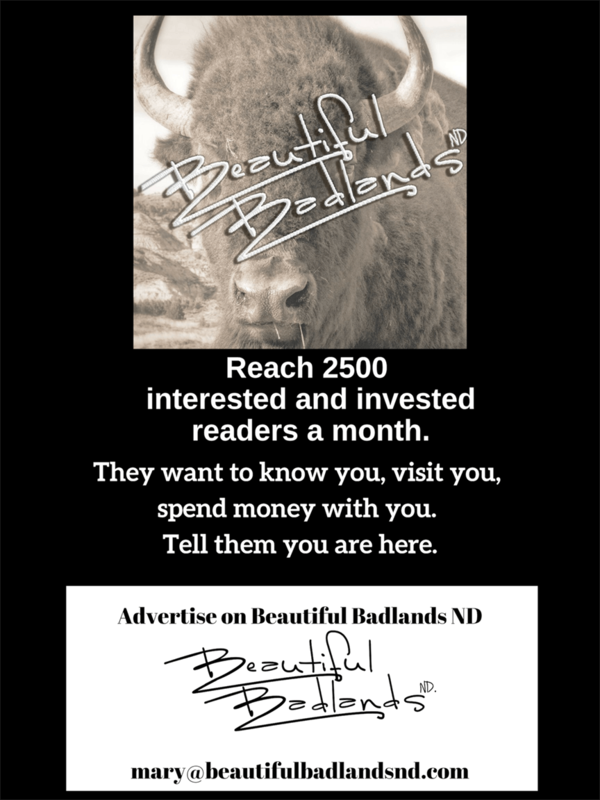 And so it was for us on this badlands adventure! After a day of driving to find just the right spot for fall hiking and camping, settling in to prepare an evening meal is a real pleasure. Our main goal on this trip was to hike, to explore, to experience the fall color changes of the landscape of the badlands of western North Dakota, and to do so somewhat in isolation. After a long drive, we attained that goal. Elkhorn Campground was perfect for our wants! What we didn’t realize, though, was what one of the best experiences of our travels would be. Food! Rains had recently been plentiful in western North Dakota in the sense of creating a moist enough environment so that camp fires were allowed. In years past when we had camped, fires were not allowed as the vegetation was so dry. This was the first time we’d really taken note of the fire rings and grates at the campsites. We found at Elkhorn Campground they were designed to be used for cooking! Could there be any better way to begin a day of badlands hiking and exploration than with a cup of coffee brewed fresh over a campfire? Our coffee mugs made by Tama Smith of Prairie Fire Pottery in Beach, North Dakota are our favorite for camping in the badlands! The heavy gauge fire rings and cooking grates make it easy to cook over a fire at Elkhorn Campground. The camp fire rings are heavy gauge, and deep, with substantial grates at Elkhorn Campgroud. How does one cook with cast iron when camping? We’re determined! Now that we’ve experienced such a campfire/grate set up such as Elkhorn Campground provides, we want to add a new skill set to our outdoor experiences in the badlands of North Dakota. Campfire Cast Iron Cooking. We need help! What recommendations do you have for cast iron cookware, what utensils work best, and what recipes work well? How should we cook over a campfire? Do you have recommendations, experiences to share? We’d love to learn from you, the experts! Campfire cooking becomes an integral part of the camping experience at Elkhorn Campground in the badlands of North Dakota. For more insights about camping in the badlands, click here: It’s Not Too Late To Camp! Those coffee mugs! Click here to learn about Prairie Fire Pottery in Beach, North Dakota.